The year 1959 marked the beginning of a cultural explosion and the birth of a new attitude to live life to the full – an attitude that inspired a revolution in music, art and culture – from rock ‘n’ roll to Andy Warhol. This hard-won freedom of expression created the world we live in today and still shapes the culture that surrounds us. The original iconic ’59 spirit lives on today in every Triumph Modern Classic, each loaded with original character, iconic style and modern capability. 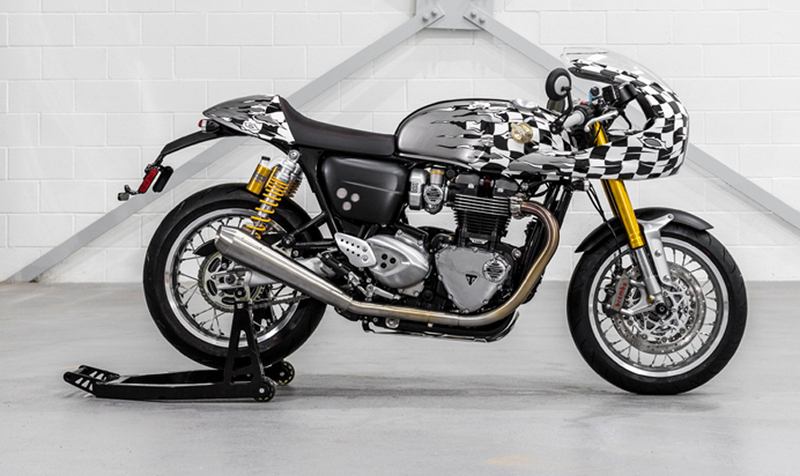 To celebrate this, Triumph has joined forces with the British contemporary artist D*Face to create three art-inspired custom Modern Classics, under the banner of ‘The Spirit of ’59’. A long-standing Triumph fan and owner, D*Face fuses Street Art, Pop Art and Punk in a guerilla creative style, selling his art the world over. Working closely with the Triumph team at their factory headquarters in Hinckley, he has customised three unique bikes inspired by the Spirit of ’59, each one a model from Triumph’s Modern Classics range. Anyone who takes a Triumph Modern Classic for a test ride between the February 7, 2018 and April 30, 2018 will have the chance to win one of these unique bikes (full terms and conditions are available on the Triumph website for participating markets). From the moment pop culture exploded in the late 1950s, a wave of creative individualism saw the motorcycle become synonymous with personal freedom and Triumph Motorcycles quickly cemented their place as the bike of choice on both sides of the Atlantic. For the music and movie stars of the 60’s, from Steve McQueen to Bob Dylan, the Triumph Bonneville helped define their style and represented their shared attitude to life. Today, for a new generation of famous motorcycle fans from Tom Cruise to David Beckham and Tom Hardy, Triumph’s Modern Classics continue to encapsulate all of the spirit of individuality and freedom born in ’59. The original iconic Bonneville T120 was famously named to celebrate Triumph’s 1956 land speed record on the Bonneville Salt Flats in Utah, USA. First launched in 1958, the Bonneville T120 is commonly regarded as a game changer in terms of performance, style and attitude. A race winner straight out of the crate, it went on to define the benchmark for design, engineering and handling, and heralded a new era of accessible performance in motorcycling. Chosen both by famous bikers and a new generation of teenage café racers for its thrilling British twin engine, legendary handling, style and character, it encapsulated all the passion and attitude of the era to live life to the full. Nowadays, it’s these elements married to class that are leading modern rider-focused technology, making the new Bonneville family the authentic Modern Classic choice. 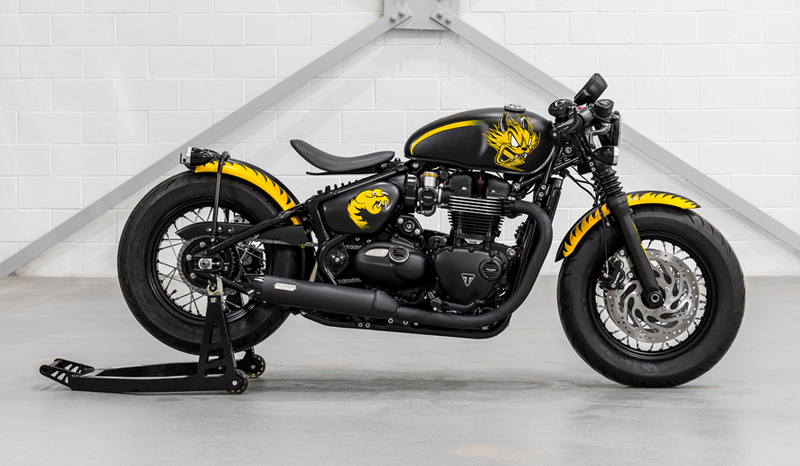 D*Face has personally customised three unique Modern Classic bikes as part of this unique art collaboration: a Bonneville Thruxton, a Bonneville Bobber Black and a Bonneville T120 – painting the fuel tanks by hand and configuring each bike individually using custom Triumph accessories. The hand-painted designs are unique and celebrate the Spirit of ’59 through D*Face’s distinctive and original style. 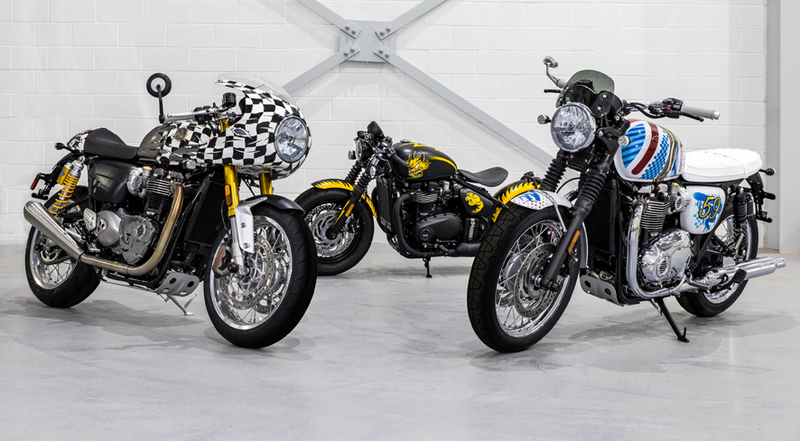 The result of collaboration between two British icons, each bike can be considered an instant collector’s item and a true work of art – three unique motorcycles in the world. As one of the UK’s most prolific street artists, D*Face has been at the forefront of his practice since his initial breakthrough in 2005. With countless murals and exhibitions across the globe, from Japan to the USA, his vibrant pop style and punk aesthetic have become synonymous with British Street Art. His work sells regularly to international buyers at auction houses including Sotheby’s, Christie’s and Bonhams. 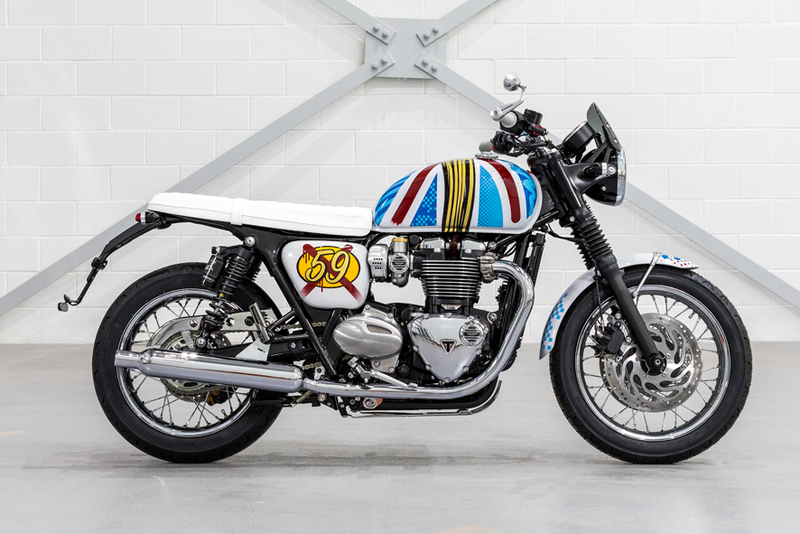 As both a partner in Rebels Alliance Motorcycle Company in East London and a Triumph rider for many years, the Spirit of ‘59 represents the sense of individuality that drives his work and combines his two greatest loves: art and bikes.